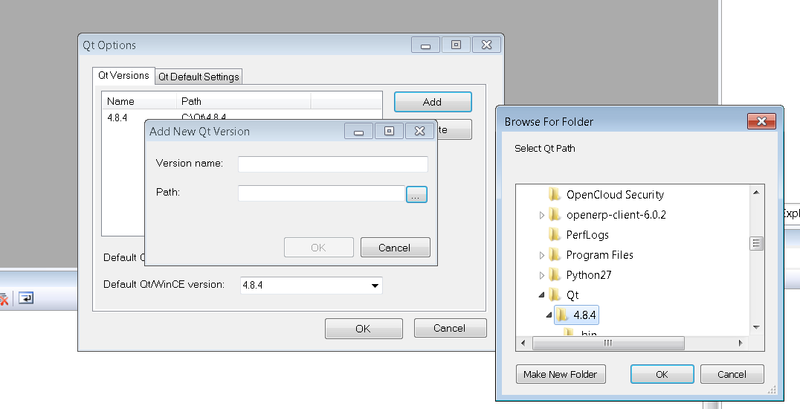 Qt is a cross-platform application and UI framework (http://qt.digia.com/). Toradex did several optimisation in the display driver to improve the performance of Qt on the toradex modules. If you like to improve the graphic performance, take a look here. Download the Qt installer directly from Toradex. Qt 4.8.4 OpenGL SDK (module with OpenGL support e.g T20/T30) or Qt 4.8.4 SDK (for hardware with No OpenGL support e.g.Vybrid). Download and install the Visual Studio Add-in 1.1.11 for Qt4 [here]. Download the installer qt-win-opensource-4.8.4-vs2008.exe and choose the installation directory as C:\Qt\4.8.4_x86 during installation steps [here]. Install the WinCE 7 SDK provided by Toradex [here]. Make sure you have installed VS2008 with SP1. If you have installed later Toradex SDKs you have to patch the QT SDK installation. The following steps need to be done if your SDK is either called Toradex_CE600 for CE 6 or Toradex_CE700 for CE 7. Run the Toradex SDK Name Updater in order to migrate all the QT examples and demos to the new SDK naming convention. Provide the QT installation path as parameter to the tool. By default the path is C:\QT\4.8.4. You get the tool from from here. Go to upper tab Qt and browse though Qt -> Options -> Add -> Path and add C:\Qt\4.8.4. Open VS2008 and go to open project. Browse to the folder C:\Qt\4.8.4\examples\openGL\hellogl_es2 and open *vcproj and build. If everything is done correctly then you will see hardware accelerated rendering on the screen. Your setup is ready for building Qt application on the Toradex module. Change the deployment folder of Visual Studio to the \FlashDisk. So you have more space as well as the deployed program will not be lost after a reboot. Repartition of memory. Check this knowledge base article for more information (less recommended). Third option can be manually placing all the Qt DLLs to "/FlashDisk/System". This way the DLLs will not have to be exported to the module again each time you run the program (saves time/disk space) and also ensures that the executable will automatically bind with the right DLL. If you like to reduce the size of Qt, have a look at http://www.formortals.com/build-qt-static-small-microsoft-intel-gcc-compiler. You might face authentication related errors during building the example program. If this is the case close the project and open it again by going through the project folder (*.vcproj).